Lucile Weaver - McMeekin is pictured with her husband, John, on their wedding day. Once upon a time, on a little farm in Pierceton, there lived a girl named Lucile. Lucile spent her young days feeding cattle, mowing grass, and tending to many household chores. When she wasn't busy on the farm, little Lucile loved to play dress-up and loved to read. Perhaps she dreamed of who she would become, of the places she would travel, and of the handsome man she would marry someday. In high school, Lucile had a sweetheart named John. Alas, Lucile's father did not approve, and so Lucile and John's young romance did not mature. After high school, Lucile got a job with the Soil and Water Conservation office. She spent 30 years working in the Kosciusko County courthouse. In all of the years she worked in the courthouse, she never married, as her father never approved of her suitors. Lucile cared for her parents until they both passed away. In her late sixties, Lucile rekindled the romance with her high school sweetheart, John McMeekin. John's first wife had passed away. When she was 70 years old, Lucile and John traveled to New Orleans to be married. They spent their honeymoon on a cruise in the Caribbean. Throughout their marriage, they enjoyed traveling. They visited Denmark and many European destinations and they owned a home in Florida. 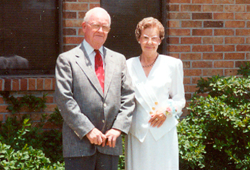 Lucile and John enjoyed more than 20 years together before John's passing in 2007. Though she waited a long time for the dreams she imagined as a little girl to come true, come true they did. When Lucile passed away at the age of 94, she made sure that the dreams of others might come true too. Lucille's Will arranged for gifts to two libraries, to her father's church and her husband's church, and an endowment fund at the Community Foundation to support a youth serving organization. Who knows? Maybe a little girl or boy who is imagining a future between the pages of a library book, or who makes new friends at the youth club, will have a happily ever after of their own, thanks in part to Lucile.